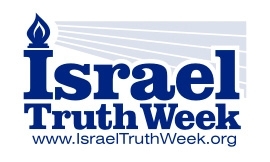 Control the message with Israel Truth posters! ITW protest signs are like large brochures; they include references and important quotes backed by resource links so protest participants can interact intelligently with the public and media with minimal training. The 20×28″ posters can also be printed very inexpensively in colour on 12×18″ 14 point card stock by most printshops; or on 8.5×11 sheets to be handed out as info-flyers. 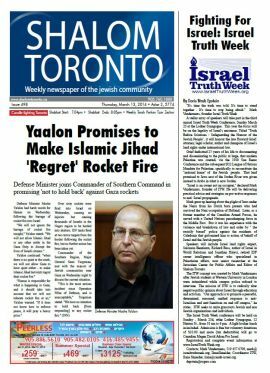 This poster appeared in the Toronto SUN ( Palestinian, Israeli supporters hit Toronto street ) on Nov 24/12 during its very first outing. 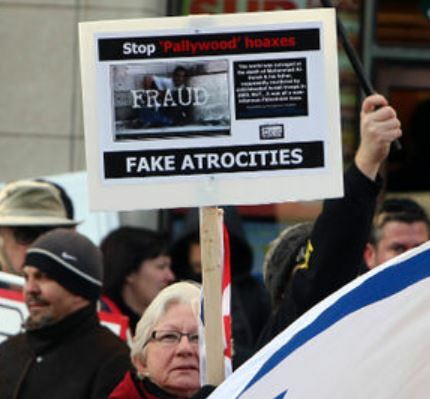 The ‘FAKE ATROCITIES’ poster refers to the Mohammed Al Dura fraud as a ‘Pallywood hoax,’ and is one of 3 created by Israel Truth Week (download below) to expose the fraudulent use of dead children as anti-Israel propaganda. 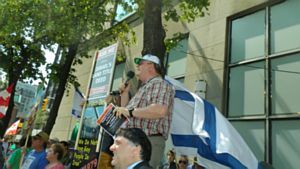 It appears, from the perspective of the newspaper’s editor at least, the sign’s message stole the show from the pro-Hamas supporters who were holding a much larger and noisier rally across from the Israeli Consulate in Toronto, Canada. The ‘STOP SEXUAL APARTHEID’ sign, which shows an image of the stoning of a woman in Iran, was one of 4 used from StandWith Us.com. In all, the media and passersby got to see 7 different messages that put the anti-Israel forces on the defensive that day. Hope to see YOUR sign in the news one day! 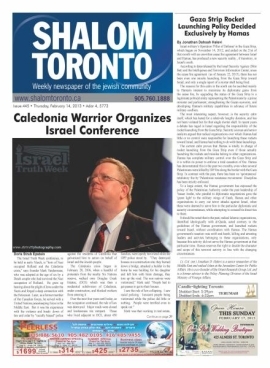 ITW founder Mark Vandermaas speaks at anti-Al Quds Day rally, Toronto in 2015 beside supporter holding ITW ‘ASK ME ABOUT ISRAEL’S LAND TITLE DEED’ poster. 1. 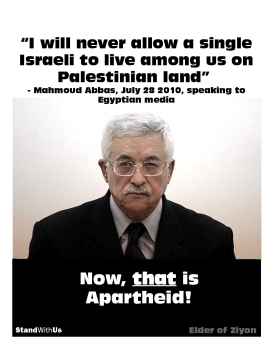 ‘NO PEACE WITHOUT TRUTH’ series: (using Israel’s land title deed vs. the ‘occupation’ narrative). 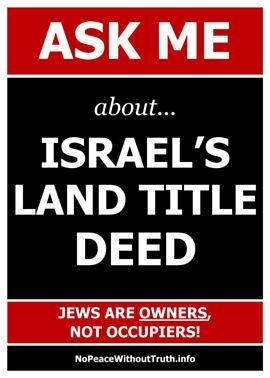 The front of these 20×28″ signs attracts attention while the back includes key quotes from the League of Nations Mandate For Palestine plus a reference link to our Mandate training booklet for sharing with media/public. Print copies of the back as an 8.5×11 flyer to use as a takeaway for inquirers. 2. 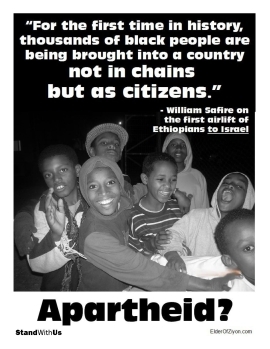 ‘STOP FAKE ATROCITIES’ series (child deaths falsely blamed on Israel) These are 12×18″ in size and can also be printed as flyers.